Joice Mujuru blocked from running for seat on top panel of ZANU-PF party, ending possibility to succeed Robert Mugabe. Zimbabwe’s vice president has been ousted from the ruling party’s leadership after a sustained campaign led by Robert Mugabe’s wife Grace, as the battle to succeed the long-serving president heats up. Joice Mujuru, 59, once seen as a top contender to succeed Mugabe, was blocked from seeking a seat on the soviet-style Central Committee of the ruling Zanu-PF party, according to reports in state-run media. “A number of other ZANU-PF bigwigs linked to her nefarious activities to oust President Robert Mugabe also (failed) to make it,” the Herald newspaper said on Wednesday. Mujuru’s failure to win a place in the central committee means she all but ceases to be in the party’s top leadership even before the congress starts on December 3, although she remains vice president at least until then. “We are witnessing something strange in ZANU-PF where all of us who were in the struggle are being accused of trying to assassinate the president,” said Rugare Gumbo, a party veteran who was suspended as spokesman after being accused of conspiring with Mujuru to topple Mugabe. “Mai (Mrs) Mujuru is like a daughter to President Mugabe. How can she decide to kill him now? 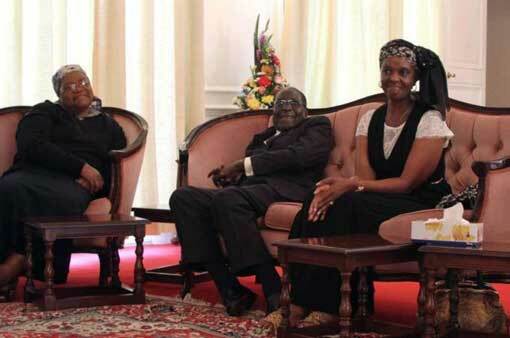 She knows no other leader except president Mugabe,” Gumbo added. The battle escalated following Grace Mugabe’s surprise nomination to lead the powerful women’s wing of ZANU-PF, prompting speculation that she wanted the top job herself. Robert Mugabe, Africa’s oldest leader, is expected to be confirmed as party chief at the congress, but the fight for positions on the powerful politburo could be decisive for the campaign to succeed him.